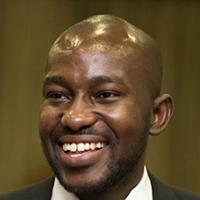 Mr. Kitso Phiri is a social justice activist with a legal background. He has been working as a human rights lawyer at DITSHWANELO: Botswana Centre for Human Rights, under its legal aid program. It is during his human rights work with Ditshwanelo that he coordinated the TB/Silicosis Regional Class Suit, a case instituted against mining companies in South Africa seeking damages for occupational lung diseases contracted during employment. Out of this case, he established BoLAMA – Botswana Labour Migrants Association, an organization advocating for the rights of ex-mineworkers which he currently coordinates. Through his work with BoLAMA where he has been facilitating access to social security benefits and advocating for the highest levels of social protection among workers, his awareness and interest for disability issues was sparked. His work has since extended to decent work for persons with disabilities and accessing compensation for workers rendered disabled as a result of occupational accidents or injuries. Mr. Phiri currently serves on the board of SAFOD – Southern Africa Federation of the Disabled as its Legal Advisor (ex officio board members).